Maybe it’s just me, but I believe peanut butter and chocolate are soul mates. No matter how hard you try to keep them apart, they will find a way to be together. So why not let them marry into delicious combinations able to satisfy even the most intense cravings? Exactly what I was thinking! I’m featuring PB Crave Peanut Butter flavors in all my desserts for the month of June. This week we’re enjoying Cookie Nookie. My sister-in-law Windy will have fits for this peanut butter. The name is very catchy but the flavor is addictive. I chose this flavor for the peanut butter cups because there are very few ingredients added to the filling, so the terrific cookie nookie flavor still shines. Don’t forget we’ll be giving away a flavor pack of PB Crave Peanut Butter so check back next week so you can enter to win! 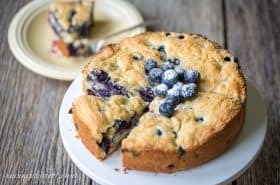 Besides the peanut butter you will need unsalted butter, confectioners’ sugar, semi-sweet chocolate chips, salt, and 4 milk chocolate candy bars. For the filling, mix together the softened butter and peanut butter. 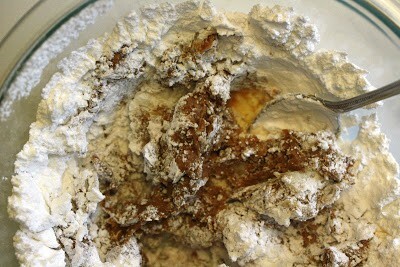 Sift in the confectioners’ sugar and blend until all ingredients are incorporated. 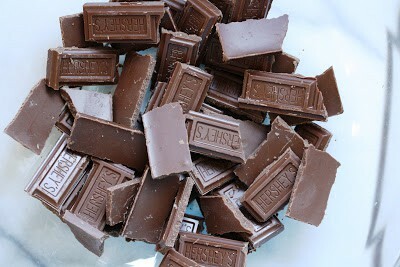 In a separate bowl break the milk chocolate candy bars into pieces. 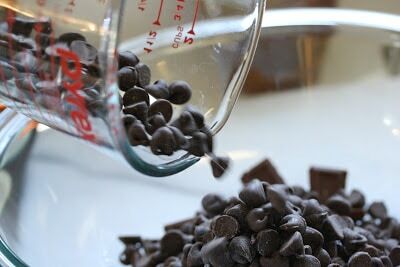 Add in the semi-sweet chocolate chips. Add peanut butter to the bowl and microwave at 50% power for one minute then stir. Repeat the process until all the chocolate and peanut butter is melted and smooth. Drop a teaspoon of the chocolate mixture into 36 mini-muffin cups. Allow the chocolate to cool for a minute. Then using the back of a small spoon or a table knife, pull some of the mixture up the sides of the cup to create a well. I forgot to take a picture of that step so you’ll just have to trust me. 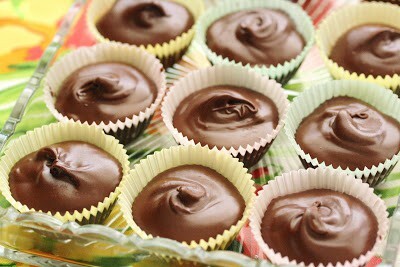 Place the chocolate cups in the refrigerator for a minute while preparing the filling. Roll the filling mixture into 4 equal sized logs. My husband came through the kitchen at this point and asked if I was making hot dogs. No dear! 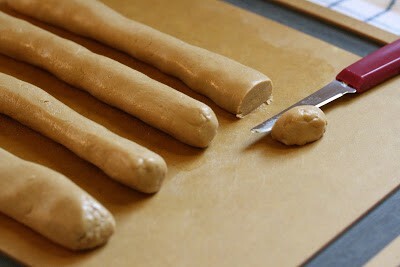 Just peanut butter logs. Slice the filling into discs that will fit into the chocolate cups without covering the entire cup. 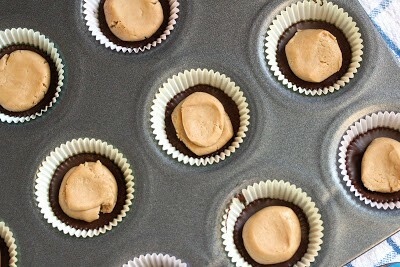 You will want the chocolate to be able to drip down around the sides to seal the peanut butter in the center. Drizzle with the remaining chocolate mixture until all peanut butter filling is covered. Refrigerate until set then transfer to an airtight container. 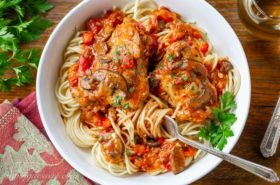 Remove from the refrigerator 30 minutes before serving. 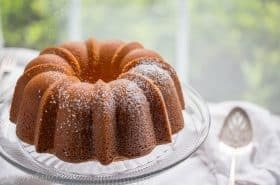 If you prefer a little creamier center, use less confectioners’ sugar. Classic flavors combine for a wonderful treat everybody will love. 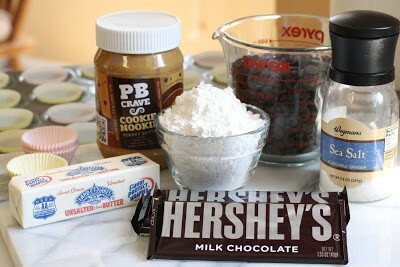 n a small bowl combine 1/2 cup peanut butter, salt, butter and confectioners’ sugar. Blend until smooth. Set aside. 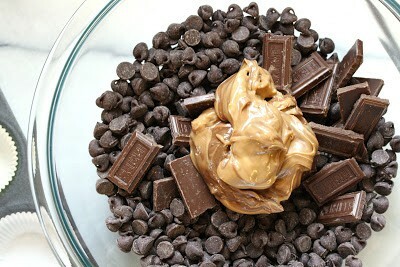 Combine the candy bars, chocolate chips and the other 1/2 cup peanut butter in a medium bowl. Microwave on 50% power for 1 minutes. 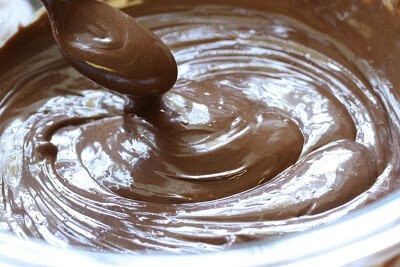 Stir the mixture then repeat until all the chocolate is melted. Drizzle 1 teaspoon of the chocolate mixture into the bottom of 36 mini-muffin cups. Allow to cool for a minute. 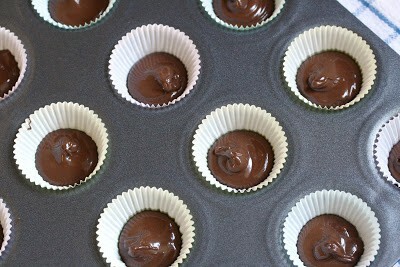 Take a small spoon or table knife and pull some of the chocolate mixture up the sides of the paper cups to form a well. Refrigerate for a few minutes while getting the filling ready. Roll the filling into 4 logs of equal width. Cut into equal pieces and roll into a ball. Place one ball into each chocolate cup. Press down gently to flatten the top. 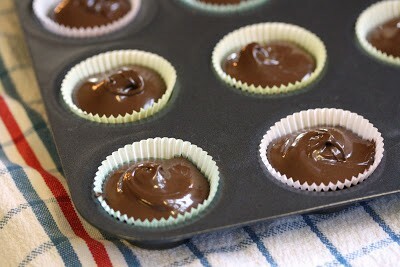 Drizzle with remaining chocolate mixture sealing the sides and completely covering the top of each cup. Refrigerate until set. 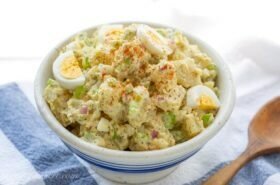 Store in an airtight container and remove from the refrigerator 30 minutes before serving. Enjoy! So you want to try these wonderful, natural peanut butter flavors? Guess what??? 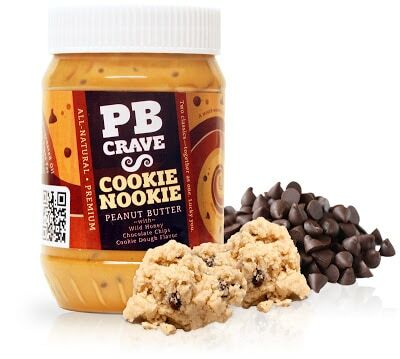 PB Crave will be coming to a store near you in the next month. They’re hitting the market soon so watch for your favorite flavors. Please don’t forget about the give-away next week so please check back. Hope you have a wonderful week. It’s back to work for me on this sunny Monday. School’s out, people are going on vacation, the garden is getting thick and lush and we’re getting the grill ready to go. Summer’s here! I just made these tonight for my Grandsons birthday party for tomorrow. These look so good when i made it. Hope your grandson has a wonderful birthday. 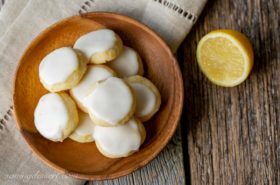 They are tasty and I am sure the kids will love them! We LOVE peanut butter at our house. I add it to brownies,cookies, icing, you name it. Your peanut butter cups are right up my alley! I wish we were neighbors because I would totally be knocking on your door trying to eat these! They look so great! 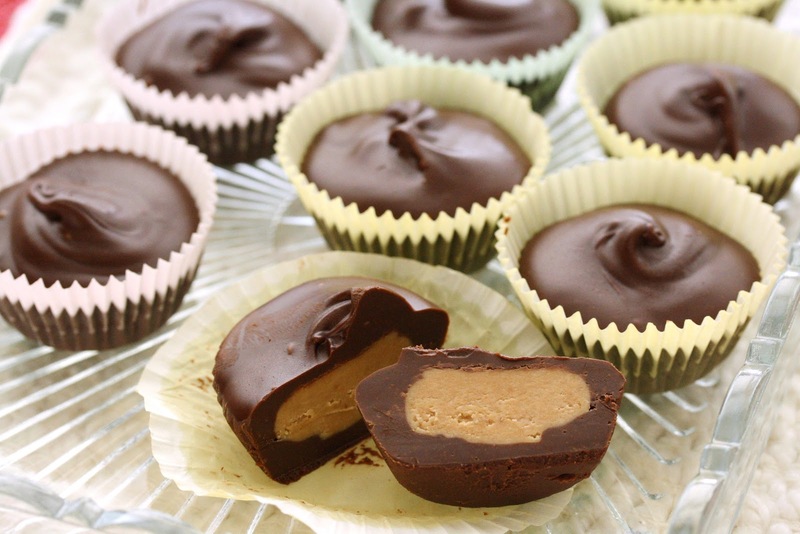 I need to try to make them…my girls LOVE peanut butter cups! As always, I wish I could pick up just a serving of whatever you are making. Your PB cups are gorgeous! I've made them before, but they've never turned out that pretty. Have a wonderful week!